First of all, you'll notice some new ways to follow my work on the left side of my website. I've added a GoodReads page for those who enjoy my books, a LinkedIn company profile for those who want to connect with me professionally, and a Facebook page to keep up to speed on my updates through social media. Plus, I'll be kicking off my new Facebook page with a live Q&A on Wednesday, December 13 at 8:30 Eastern time, so you really won't want to miss that. You'll also notice that player usage charts are up to date with 2017-18 data, thanks to the data provided at Natural Stat Trick, and the talents of the venerable visualization wiz, Robb Tufts (@RobbTuftsHockey). If you like the data provided by Natural Stat Trick, then it's in your own best interests to get more resources in their hands by supporting their Patreon. Last time, I ran a poll to see who was the current Norris favourite. My most recent poll was trying to identify the frontrunner for the Vezina. 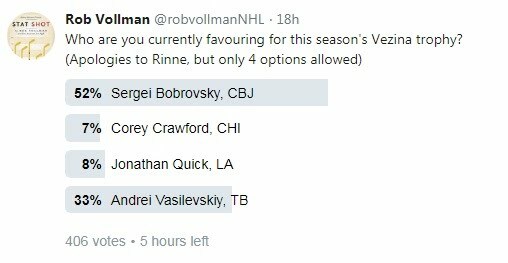 According to Twitter followers, it's a two-goalie race between last year's winner Sergei Bobrovsky, and Andrei Vasilevskiy. There's still time to vote, if you're reading this soon enough. Vasilevskiy's inclusion is another win for the home plate save percentage statistic. In Hockey Abstract 2017, he ranked first by this metric. Prior to when this stat was introduced in Hockey Abstract 2014, goalies were usually judged using straight-up save percentage, which treats every shot equally. After home plate save percentage correctly forecast a breakout season for Devan Dubnyk, whose career was thought to be over, a lot of attention was drawn to adjusting save percentage in this way. For example, it led to versions that divided the ice into three zones (low, medium, high) instead of two (home plate, outside). In the Hockey Abstract 2015 Update, home plate save percentage did it again, correctly forecasting a breakout season from Thomas Greiss. With yet another successful prediction of a breakout season in Vasilevskiy, it's no wonder there's so much more attention paid to home plate save percentages than before. Vegas is an obvious inclusion, but I can't argue too strenuously against New Jersey, either. If you consider the disparity between their points in the standings, and either their shot-based metrics or their goal-based metrics, you would expect them to decline over the long run. On average, a team's top four scorers combine for 41% of a team's total. In Philadelphia it's 52.6%, as of December 4. Next is Buffalo at 51.0%, and St. Louis and Calgary at 46.6%. Thinking that this might have been one of the causes of Philly's 10-game losing streak, I took a look at depth this week, and made some interesting discoveries, which included another team that could be in trouble. As of December 4, teams had an average of 35 points from its three highest-scoring defensemen. But, for Buffalo, it was 16, followed by Vancouver with 22 and Carolina with 27. My friend Stan Nieradka (@smn013) also pointed out that the Sabres have used 11 defensemen this season, none of whom have scored on a combined total of 246 shots. Johnny Gaudreau is having a heck of a season. At various points he has scored or assisted on over half of Calgary's goals, and has twice as many points as anyone on his team, except his centre Sean Monahan. My last point is aimed at the statisticians and stat-hobbyists out there. If you're looking for datasets to play with, you can always download one of my datasets. But, another option is to use Kaggle. They have datasets of all different kinds. For example, Kevin Kazmierczak (@kasmiekr) is looking at who could make the Hall of Fame, much like Iain Fyffe's Inductinator that was laid out in Hockey Abstract 2014, and Cam Nugent is building a salary prediction model, just like Matt Cane. So, check out projects like theirs, and it might inspire you to make one of your own! Brandon Davidson was placed on waivers, and was scooped up by Edmonton. Given his career relative SAT of +2.8%, which ranks 26th among the 195 active D who have played at least 100 games, he's not a bad 7th D.